A new platform of cooperation to advocate for the human rights of religious minorities, first and foremost religious freedom. This is the outcome of the Forum “The Future of Religious Minorities in the Middle East”, organized by the Center for the Middle East of the Fundación Promoción Social and RSC Religion & Security Council. 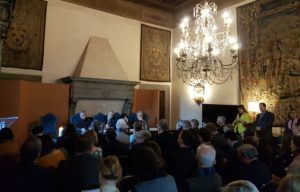 The Forum was hosted in Rome on December 11 by the Embassy of Italy to the Holy See, and gathered institutional authorities, political and religious figures, diplomats and officials, scholars and experts, journalists and representatives of the civil society. 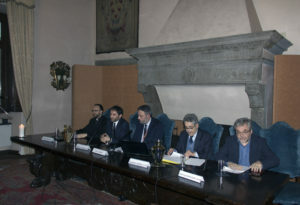 The event was preceded by a press conference at the Italian Senate of the Republic. The proceedings addressed the predicament of religious minorities in the areas of crisis (Syria, Iraq, Lebanon, the Holy Land, Egypt); the misuse of religions to fuel conflicts, discrimination, and violence; citizenship and religious freedom as factors of communal integration; interreligious dialogue in conflicts resolution; the engagement of the Vatican, the Italian Ministry of Foreign Affairs, and the whole international community in the protection of minorities and in the promotion of religious freedom. A particular focus was placed on the future of Christians in the Middle East, and on the social, cultural, political, and security challenges they continue to be faced with in their homelands. The Forum was promoted in partnership with the Custody of the Holy Land, the Equestrian Order of the Holy Sepulcher, the Notre Dame University-Louaize, and the Middle East Institute for Research and Strategic Studies. The session “Interreligious Dialogue and Conflicts Resolution: What Role for Christians?” pointed the way forward for interreligious dialogue as an instrument of reconciliation and peace-building in the Middle East. Moderated by RSC Chairman Emiliano Stornelli, the session featured as speakers Fr. Laurent Basanese SJ, Director of the Center for Interreligious Studies, Pontifical Gregorian University, Elie Al Hindy, Associate Professor at the Notre Dame University-Louaize and Director of the Middle East Institute for Research and Strategic Studies, Abdellah Redouane, Secretary General of the Cultural Islamic Center of Italy, Ambrogio Bongiovanni, Professor of Interreligious Dialogue at the Pontifical Urbaniana University. According to the main findings of the session, interreligious dialogue – if it is to defuse tensions and confrontational situations effectively – should not be instrumentalized as a “tactic” of proselytism by the parties involved, nor question the “tenets” of each other’s faith. The aim of dialogue between religions is to ensure their mutual existence, and to this end it must be based on fraternity and openness to intellectual exchange, the commitment to deepen the knowledge of the Other, and the awareness of the interdependency binding together the variety of religious groups and denominations throughout the region. In short, an authentic and fruitful process of interreligious dialogue must be based on the acknowledgment that the Middle East is the cradle of all Abrahamic religions. RSC Chairman noted that “the path of interreligious dialogue in the Middle East, as well as in other areas of the world, is intertwined with conflicts resolution”. “Interreligious dialogue can help heal and leave aside historical wounds, and prevent theological or doctrinal differences from being translated into ideological postures triggering sectarianism, disputes, and terrorist manifestations”. In this context, RSC Chairman highlighted that “Christians are called to promote new prospects of interreligious dialogue aimed at conflicts resolution on the regional and local level, engaging the institutions and the civil society at the same time”. “Dialogue and openness are inherent to the Christian identity and culture”, he pointed out. Therefore, “an active role of Christians can best serve the purpose to create new spaces for the encounter and cooperation in the religious dimension, facilitating the achievement of sustainable and enduring peace settlements to the crises that have long been affecting the peoples and the religious communities of the Middle East”, RSC Chairman concluded.